It’s not easy to get on the Entertainment main page of Digital Journal. There are so many articles written about famous people that indie artists seem to not be showcased on the main content pages. Usually if the story doesn’t pick up interest in the first few hours, the article disappears into obscurity never seeing the light of day on the main Entertainment page. Even more difficult is to have an article about indie artists featured on the homepage of the main Digital Journal site. Well, I’m proud to say that my article hit and headlined the main Entertainment section, the A&E section and then the main HOMEPAGE of Digital Journal site. See the screenshot above and you can see in the top right corner the icon about “Video: Skydiving author”. We had over 360 Facebook shares in a matter of 21 hours. When I checked the other articles of famous names, they had little or no social media shares at all. So a big THANK YOU to all my supporters, indie artist friends and authors. We can make a difference together! Author says sky diving is like publishing: It’s TERRIFYING! Cairn Rodrigues, newest Fiction Frenzy TV VLog author, author of The Last Prospector (thelightstealersong.com) explains how indie publishing makes authors dare devils. She proves her point by skydiving onto the show. 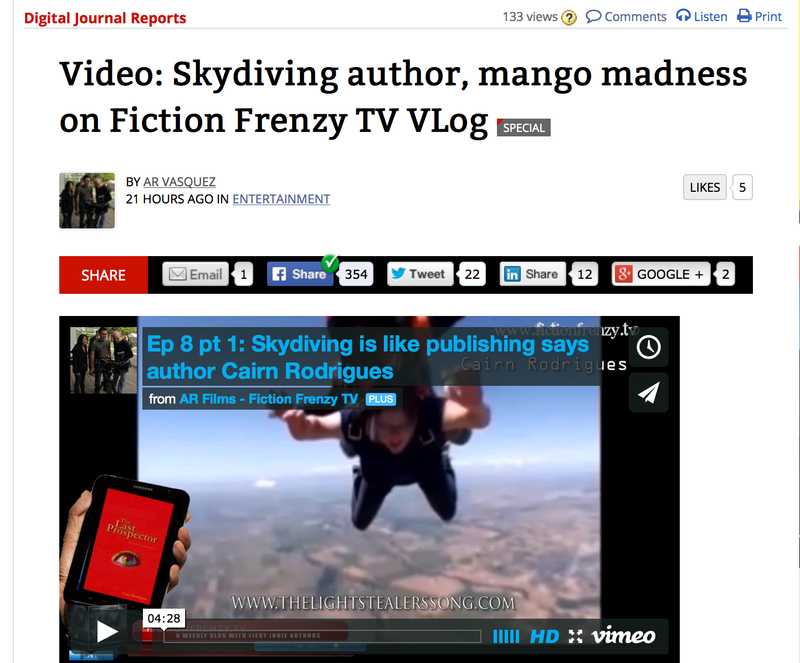 Ep 8 pt 1: Skydiving is like publishing says author Cairn Rodrigues from AR Films – Fiction Frenzy TV on Vimeo. Nicole and Anne-Rae are shocked when a stray mango bops Josefina on the head inducing her to speak in gibberish. Ep 8 pt 2: Woman speaks gibberish after freak mango accident- Fiction Frenzy TV VLog show funny from AR Films – Fiction Frenzy TV on Vimeo. Out:Think has helped NYT best selling authors such as: Hugh Howey, Author of the award-winning Molly Fyde Saga and the New York Times and USA Today bestselling WOOL series. Ep 7 pt 1: Interview with Tim Grahl “be relentlessly helpful” Book Marketing tips from AR Films – Fiction Frenzy TV on Vimeo. Ep 7 pt 2: Interview with Tim Grahl Sell 1000 copies of your book from AR Films – Fiction Frenzy TV on Vimeo. Christine Steendam, author of “Heart Like an Ocean” and Jeff Dawson author of Occupation give their thoughts on Tim Grahl’s interview. Ep 7 pt 3 VLog thoughts by Christine and Jeff on Tim Grahl’s interview on book marketing from AR Films – Fiction Frenzy TV on Vimeo. Khaled Talib, author of Smokescreen takes us to Boat Quay in Singapore where an action scene from his novel “Smokescreen” takes place. Watch to find out how explosive it is and more! Jeff Dawson, author of “Occupation”, is back to help explain what a “Hook Line” is. Ep 7 pt4 – Tour Boat Quay with Khaled, Jeff Dawson’s Hookline – Fiction Frenzy TV VLog channel from AR Films – Fiction Frenzy TV on Vimeo. “Be relentlessly helpful to build your fan base” and “Authors jump out of planes so you don’t have to” are but a few of the quirky and fun topics on the latest episodes of Fiction Frenzy TV VLog show. A frenzy of indie artists vlog to viewers from all over the world in AR Films Fiction Frenzy TV show featured exclusively on Digital Journal. Two new episodes jam packed with funny yet informative videos showcasing indie authors and filmmakers were released on Fiction Frenzy TV‘s YouTube and Vimeo channels this month. Fiction Frenzy TV is a reality VLog show where indie artists grapple with their day to day responsibilities while juggling the pressures of achieving success as independent artists. The weekly show not only provides insightful information about the ups and downs of the indie publishing, music and film making business but pokes fun at the artists themselves.